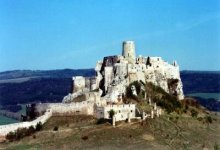 The castle lies on a limestone rock 634 m above sea level and 200 m above the surrounding terrain. It is a national cultural monument and one of the most valued monuments of the Spiš region. It shows the development of our architecture from the 12th to the 18th century. With the area of 4 hectares (41 426 m2), it is one of the largest castle complexes in Central Europe. The history of the castle is very rich. The rock, on which it lies, had already been inhabited in the Stone Age. The largest extent of prehistoric settlements in this region was recorded around the end of the era before Christ and the beginning of the era after Christ. There was a huge fortified settlement of the so-called Púchov culture that time. Walls of this object have been discovered during a recent archaeological research. The research also revealed some peasant’s and craftsman’s houses and a large cult object. The extent and type of the fortification suggest that there was the administrative centre of the region of middle Spiš. The castle was surrounded by bulwarks, that went through its largest courtyard and are still noticeable today. Another strongly fortified settlement was established at the nearby hill Dreveník after the downfall of the original settlement. Later on, the present castle of Spiš was built up.